I should ask, got shutters inside? 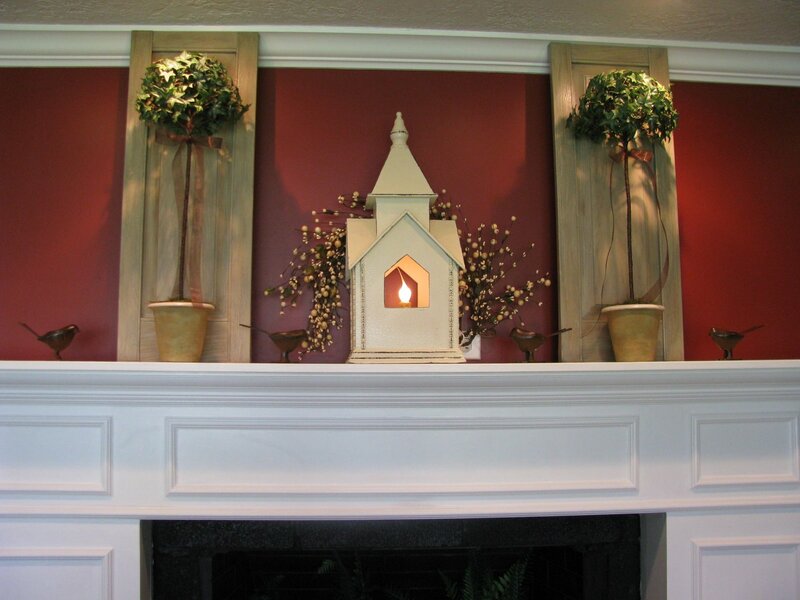 this week when she shared how she framed out her living room mirror with shutters. Anyway, it reminded me what my cute neighbor did in her boys' room with some old shutters. She painted them a dark brown and screwed them in on either side of the window. I love the way they frame the window and just give a pop of color and texture to the room. Oh, and do you just love those little cowboy boots her son used to wear on top of the dresser? They are the cutest, and yes, we are most definitely in Texas. I tried to get the whole window, but being the photographer that I am :), it didn't turn out, but you get the picture, right? How about as a headboard? Sooooo...got shutters? On the inside? 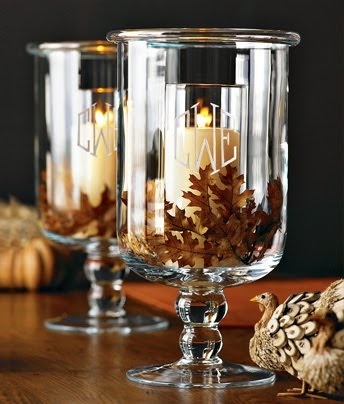 Have you used them in your decor? 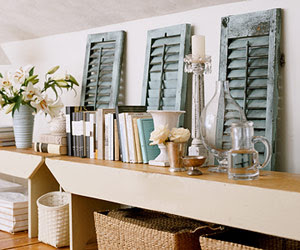 I love shutters as well , in fact I built a pair to cover my tv back in March and I love the charm they add. http://chriskauffman.blogspot.com/2009/03/under-wraps.html here is a link to the post where I show them , I also show how I did in preceeding posts. Thanks for sharing all the shutter ideas! I love them all. Coudn't get any cuter or more practical!! Ooo...I love the inspiration! I love shutters but had few ideas what to do with them. Now I know! Thanks! I SO love this idea! 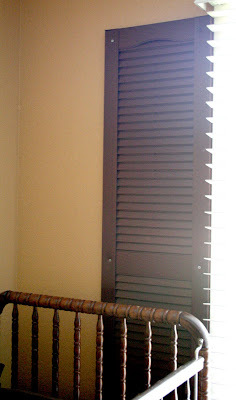 I used shutters for the headboard in our guest room last summer. Got them off of Craig's List for $15, sanded, painted and mounted. What a great project! Here are a couple pics if you're so inclined!! No...but I am dying to! I have been on the hunt for some for a while, with no luck yet. I saw that picture in BHG and fell in LOVE. The size, color, and placement is PERFECT! I saw some at the Habitat Restore a few weeks back. Now I'm thinking I should have bought some. I hope they will still have them this weekend when I return. Keep your fingers crossed. I love shutters and love all these neat ideas. Thank you for sharing them. I've been looking for some old shutters for months now without luck! I love the look. Thanks for the inspiration! I have shutters in my garage and have been wanting to use them for years but nothing seemed to feel right, now I have a few other things to try! 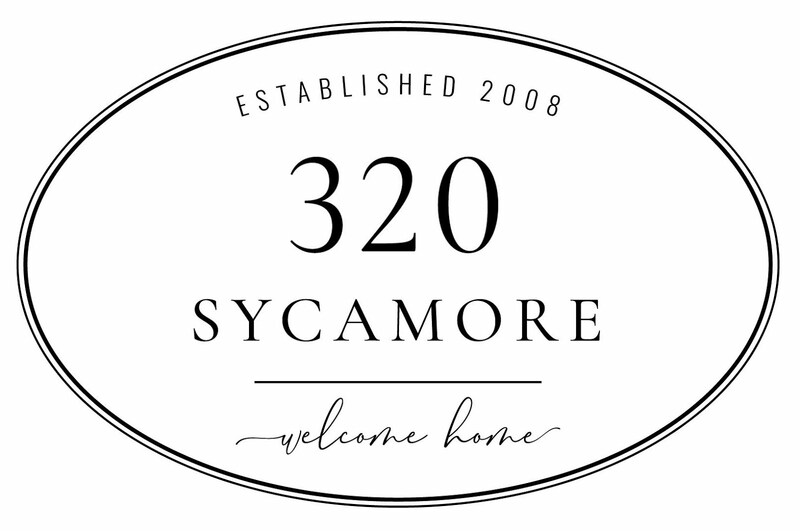 I recently discovered your blog and have enjoyed it very much! Hey! I recognize some of those shutters! Thank you so much for the link. You are such a sweetheart! Great shutter ideas! I have to keep an eye out for some now!! All great ideas! Thanks for sharing! Oh my gosh I love all of these ideas, especially the headboard, and covering the TV. Thanks for sharing! No, but I need some now! I love all these shutter ideas!!! They're all so beautiful! Shutters are so much inspiring....headboard is eye pleasant.